Tehran Imam Khomeini International Airport (Persian: فرودگاه بین‌المللی امام خمینی‎) (IATA: IKA, ICAO: OIIE), is the primary international airport of Tehran, the capital city of Iran, located 30 kilometers southwest of Tehran, near the localities of Robat Karim and Eslamshahr and spread over an area of 13,500 hectares of land. Along with Mehrabad International Airport, Imam Khomeini Airport is one of the two international airports serving Tehran. All International flights in Tehran are currently served by this airport and all domestic flights are served by Mehrabad Airport. the airport has served about 9 million international passengers. It ranked 3rd in terms of total passenger traffic in Iran after Tehran Mehrabad Airport and Mashhad Airport. The airport is operated by the Iran Airports Company and is one of the home base of Iran's international airlines, Iran Air, Mahan Air and some other. Construction of the airport began prior to the 1979 Iranian revolution. The original designers were Tippetts-Abbett-McCarthy-Stratton (TAMS), an American engineering and architectural consulting partnership. A local joint venture was formed between TAMS and local firm Abdol Aziz Farmanfarmaian Associates called TAMS-AFFA, to carry out the full design and supervision of construction. Following the Iranian revolution, however, the project was abandoned until the government of Iran decided to design and build the airport using local expertise. French firm ADP was selected to head the local designers and engineering firms. A turnkey design and build contract was awarded to a local general contractor company, Kayson Co., to carry out and manage the construction. After two years this contract was abandoned and was awarded to a bonyad, the Mostazafan Foundation. Iran Air Airbus A300, being refuelled at Imam Khomeini International Airport. After construction of Terminal 1 was completed by the Mostazafan Foundation, the Iranian Civil Aviation Organization decided to turn the management of operations along with the construction of the second terminal to the TAV (Tepe-Akfen-Vie) consortium consisting of two Turkish (Tepe and Akfen) and an Austrian (Vie) companies. The original opening was scheduled for 11 February 2004, the onset of the auspicious "Ten-Day Dawn" (1–11 February) celebrations, marking the anniversary of the 1979 Islamic Revolution. There were numerous issues surrounding the construction of the airport including the supply of fuel to the new airport, and a delay in signing a deal with the Iranian oil ministry forced a delay in the opening of the airport until 8 May 2004. Just prior to the opening on 8 May, two local airlines refused to switch to the new airport. Economic Hayat-e No daily quoted Ali Abedzadeh, director of semi-privately owned Iran Aseman Airlines, as saying "We are not flying from an airport run by foreigners." 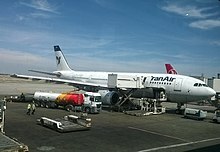 TAV officials were ordered to withdraw their personnel and equipment from the airport on 7 May 2004, and operations were handed over to Iran Air. "I think they (the armed forces) were given false reports that the Turks were still on the site, while they had all evacuated the airport by Friday," airport manager Hossein Pirouzi said. However, on 8 May, a few hours after the opening of airport, the Revolutionary Guards of the Iranian Armed Forces closed it, citing security fears over the use of foreigners in the running of the airport. Only one Emirates flight from Dubai was allowed to land. The second flight from Dubai, which was an Iran Air flight, was forced to land in Isfahan International Airport, because the Mehrabad Airport did not allow it to land there after the Imam Khomeini airport was closed by the armed forces. The rest of the flights were diverted to Mehrabad. On 11 May, in a meeting of the Turkish Foreign Ministry Undersecretary Ugur Ziyal and Iranian Foreign Minister Kamal Kharrazi, the Turkish expressed unease about the actions of the Iranian armed forces. The airport reopened on 13 May, as deputy head of Iran's Joint Chiefs of staff Brigadier-General Alireza Afshar stated "because foreign companies will no longer be in charge of the airport's operation, security obstacles are removed." Mahan Air Airbus A340 parked at IKIA. In April 2005 the $350 million Imam Khomeini International Airport was reopened under the management of a consortium of four local airlines—Mahan Air, Aseman, Caspian Airlines and Kish Air—although no formal contract appeared to have been awarded. Soon later management of the airport was transferred to the Iran Airports Company which in behalf of Iranian Ministry of Roads and Transportation is in charge of operating all civil and governmental Iranian airports except some belongs to special organizations like Oil ministry or Armed Forces. On 26 October 2007, it was announced that as of 28 October 2007 at midnight, all international flights except those bound to and from Damascus, Jeddah and Medina were transferred to the Imam Khomeini International Airport and the IKA became Tehran's primary international airport. In 2016, as a result of worsening ties between Saudi Arabia and Iran, all Hajj flights from Iran were terminated, rendering IKA the only international gateway to Tehran. In 2013, the airport handled 4.756 million passengers, a 20% increase over the previous year. This made it the eleventh busiest airport by international passenger traffic in the Middle East. The airport handled 98,904 tonnes of cargo in 2013. The total number of commercial aircraft movements was 36,827 in 2013. Subsequent to the lifting of nuclear-related sanctions in mid January 2016, Air France resumed flights to the Iranian capital after having suspended them in 2008. On 17 April 2016, Air Asia resumed Tehran services by offering direct flights from Bangkok and Kuala Lumpur to Tehran after having suspended them in 2012. These flights were subsequently canceled in 2017 and 2018. Furthermore, various other airlines including Austrian, Alitalia, British Airways, KLM, China Southern Airlines and Thai Airways either resumed or ramped up frequency of their flights to Tehran. Nevertheless, some of these routes proved not profitable, resulting in the cancellation of Tehran routes by KLM, British Airways and Air France effective September 2018. IKIA's first active (and as of July 2018, its only operational) terminal has a total annual handling capacity of 6.5 million passengers and 120,000 tonnes of cargo. In 2017, it handled nearly 9 million passengers. The second terminal, called the Salam Terminal, is currently under construction, with a capacity of 5 million passengers per year. It was meant to be opened in June 2016, but financing issues led to its opening being delayed until the end of 2018. While originally intended as a dedicated pilgrimage terminal, according to Iran's Minister of Roads and Transportation Abbas Akhoundi, it will be open to all varieties of flights. The third terminal, called the Iranshahr Terminal, is set to open in 2–3 years. It is currently in its planning phase, with the development contract awarded to the Dutch engineering firm Netherlands Airport Consultants (NACO), a subsidiary of Royal HaskoningDHV. It will have an expected capacity of 20 million passengers per year, bringing the airport's total passenger capacity to 30 million passengers per year. Once opened, the current Terminal 1 will be used for domestic flights only. There are currently two runways at IKA of which only one is operational. The operational runway is equipped with the ILS CAT II since August 2009. A second ILS system was purchased seven years ago to serve the other runway but the selling firm refused to set it up due to sanctions against Iran. The ILS was installed by Iranian technicians. A third runway positioned to the south of the existing runways and passenger terminal is in final stages of construction. In October 2015, French corporation AccorHotels opened its Novotel and Ibis-branded hotels on the airport premises, marking the entry of the first international hotel chain into the Iranian market since the 1979 revolution. The two hotels are connected to the main passenger terminal by a sky bridge passing through the airport metro station. The airport is served by the Imam Khomeini Airport Metro Station. The metro connection for IKIA was opened on 7 August 2017, as a station on the new Tehran Metro Line 8, which is an extension of Tehran Metro Line 1. There are provisions for a second station serving the planned Iranshahr Terminal (Terminal 3) in the future. Line 8 is the first 24/7 operational metro line in Tehran, serving mid-night passengers from Darvazeh Dowlat Metro Station to the Imam Khomeini Airport Metro Station. To arrive at Line 8, Line 1 passengers must transit from Shahed Metro Station to Shahr-e Aftab Metro Station, then, at Shahr-e Aftab Metro Station, passengers must board a Line 8 train. The airport is planned to be served by the Tehran-Qom-Isfahan High Speed Rail. The new link will enable direct rail access from the cities of Qom and Isfahan and a fast non-stop connection to Tehran Railway Station. The line is currently in early planning and construction phase. Imam Khomeini Airport is accessible from Tehran by car, taxi and shuttle buses via Tehran-Qom and Tehran-Saveh freeways. Airport-operated taxis serve arriving passenger 24/7. In 2017, a typical taxi journey from the airport to the center of Tehran takes around 45 minutes which costs about 850000-900000 Iranian rial or US$10 and are often light yellow Toyota Camry, Toyota RAV4, Volkswagen Caddy or IKCO Samand. On 15 July 2009, Caspian Airlines Flight 7908, a Tupolev Tu-154 bound for Yerevan, Armenia crashed into a field in the village of Farsiyan in Qazvin province (north-western Iran), 16 minutes after take-off from Imam Khomeini Airport. All 168 passengers and crew were killed. ^ "Imam Khomeini International Airport (IKA)". Retrieved 1 June 2015. ^ "Economist Intelligence Unit". 18 August 2008. ^ Reuters (29 May 2016). "Iranian pilgrims won't attend hajj amid row with Saudi Arabia". The Guardian. ^ "(IKA) Imam Khomeini International Airport". Retrieved 1 June 2015. ^ IAC. "Iran Airports Company - Home". en.airport.ir. ^ "Air France plane lands in Iran for first time in 8 years - France 24". 18 April 2016. ^ 2018, UBM (UK) Ltd. "British Airways latest of several airlines to add flights To Iran". ^ 2018, UBM (UK) Ltd. "China Southern Increases Tehran Flights from April 2016". ^ Liu, Jim. "Thai Airways adds Tehran service from Oct 2016". Routesonline. Retrieved 3 August 2016. ^ "British Airways and Air France are stopping all flights to Iran, just before crushing new US sanctions kick in". Business Insider. Retrieved 29 August 2018. ^ "KLM to suspend direct flights to Tehran". KLM to suspend direct flights to Tehran. Retrieved 29 August 2018. ^ a b c "Update on the New IKIA Terminals, Air Astana Started Tehran Flights - Aviation Iran". 30 June 2016. ^ Vosler, Kent D. (1983). "Diving: Diving strength program at the University of Florida". National Strength & Conditioning Association Journal. 5 (6): 27. doi:10.1519/0744-0049(1983)005<0027:dspatu>2.3.co;2. ISSN 0744-0049. ^ "foreign hotels opeing in iran - Google Search". www.google.com.pk. 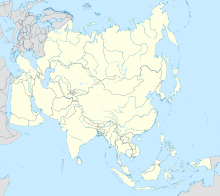 ^ 2018, UBM (UK) Ltd. "Buta Airways updates W17 operations". ^ Liu, Jim (6 February 2018). "Iran Air resumes Azerbaijan service from late-Jan 2018". Routesonline. Retrieved 6 February 2018. ^ "Iran Air adds Tehran – Kuwait City service from April 2019". routesonline. Retrieved 16 April 2019. ^ 2018, UBM (UK) Ltd. "Iran Air plans Paris CDG launch in S18". ^ 2018, UBM (UK) Ltd. "Iran Air files network expansion in S18". ^ Liu, Jim. "Mahan Air schedules Baku launch in Feb 2017". ^ "Tehran – Barcelona Service Starts in June 2017". Aviation Iran. 8 March 2017. Retrieved 8 March 2017. ^ "Iranian airline to launch Tehran-Lahore flights from Dec 18". ^ "Aviation Iran on Twitter". March 2018. ^ "Air Network - Nouvelair". www.nouvelair.com. ^ "Qeshm Air Plans Launch of Brussels Service And 'Media WiFi' - Aviation Iran". 7 May 2017. ^ "Qeshm Air vanaf 27 juni tussen Brussel en Teheran - Flightlevel". 14 June 2017. ^ Air, Syria. "Syria Air > Tehran - Moscow". www.syriaair.com. ^ "Iranian Airliner Crashes in Northwest, Killing 168". Bloomberg L.P. Retrieved 15 July 2009. "Monthly flight plan" (in Persian). Imam Khomenini International Airport official website. Archived from the original on 29 January 2008. Retrieved 16 January 2007. Airport information for OIIE at World Aero Data. Data current as of October 2006.Source: DAFIF. Airport information for OIIE at Great Circle Mapper. Source: DAFIF (effective October 2006).